I figure I should make a maintenance/project thread for my new (to me) 2005 330Ci ZHP. It probably won't be as exciting as some other project threads in here since I plan to keep the car mostly stock, but should hopefully be interesting and informative nonetheless. In July 2014 I was driving across the country to move from Philadelphia to Portland in my 2003 BMW 330Ci and had the unfortunate luck of hitting an antelope that jumped out on a small two-lane road just south of the Grand Canyon. 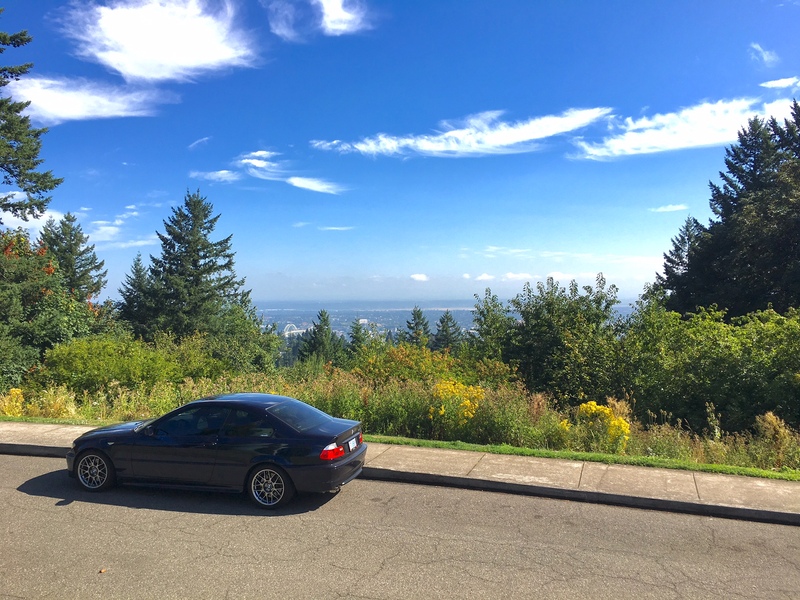 The accident totaled the car and I decided once I was settled in Portland, I would look for another 330i/Ci. 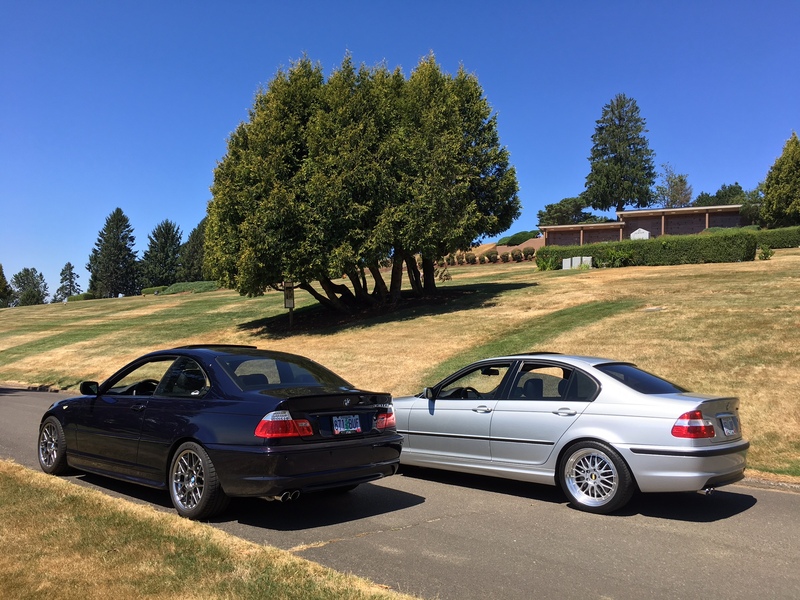 Once home I had the luxury of taking my time to look for a car, so I wanted a ZHP. After several months of lurking and posting over here in the classifieds, I finally found this car in mid-March in a local Craigslist ad. I met with the previous owners (who were also the original owners), but they ended up selling it to the first buyer that offered their asking price. Unfortunately for me at the time, it wasn't me but was a guy who I was guessing flipped cars. I religiously watched Craigslist for the next week hoping to see it again, and lo and behold, the same car popped up with a mark up in price. I met with the new owner ASAP and we came to a deal on price and it was transferred to me 48 hours later. I am pretty ecstatic, it's in amazing condition and feels great! The original owners purchased the car in Germany and drove it to port, where it was shipped to Portland. For the next 10 years the previous owners drove it to work (a total of 5 miles round trip) and took occasional road trips, amassing less than 5,000 miles a year. They didn't have children so the rear seats are basically untouched, and the car was always garaged. Complete E46 M3 black Nappa leather interior. Front seats with memory, heat, lumbar and side bolster adjustment. 08/22/14 (46,756 miles) - Oil and filter changed, safety inspection. Paperwork for an alignment and possibly new tires. 04/15/15 (49,682 miles) - Cooling system refreshed (radiator, expansion tank, water pump, thermostat, hoses, coolant temp and level sensors, coolant flush/bleed), replaced serpentine and AC belts, replaced idler, AC tensioner, and tensioner pulleys, replaced fuel filter, performed oil change (BMW 5W30) and new oil filter, replaced transmission fluid (Redline MTL), replaced differential fluid (Redline 75W90), replaced spark plugs (NGK), replaced cabin microfilter, and replaced air intake filter. 05/01/15 (49,909 miles) - Coded remote closing windows, one-click remote unlock, raised automatic locking threshold to 28 km/h, one-touch close rear windows, turned of daytime running lights using a PASoft BMW Scanner. 08/29/15 (51,200 miles) - Refreshed the rear suspension with Koni Sport shocks, new upper and lower spring pads, Rogue Engineering Rear Shock Mounts (RSMs), new dust boots, and new bump stops. 08/30/15 (51,200 miles) - Refreshed the front suspension with Koni Sport struts, new strut mounts, new upper and lower spring pads, new dust boots, new bump stops, strut reinforcement plates, and new flange mounting nuts. 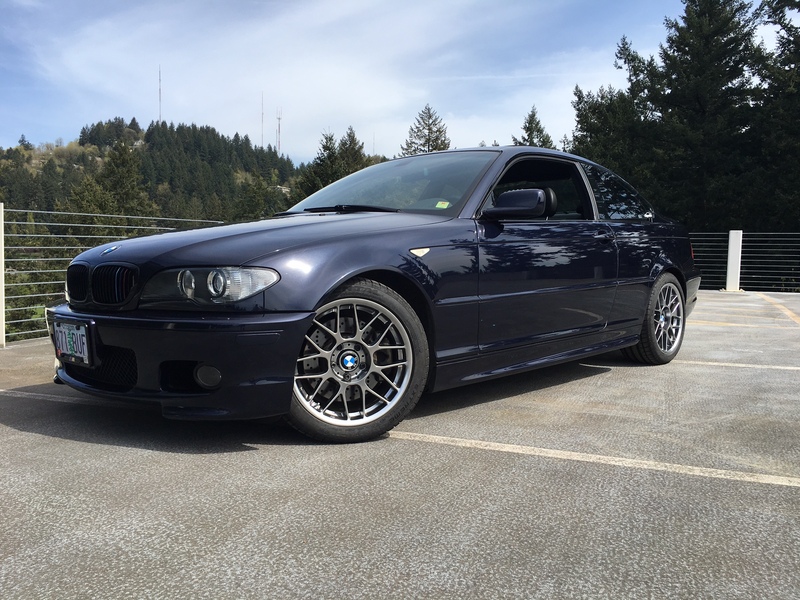 09/19/15 (51,487 miles) - Refreshed the front control arm bushings (FCABs) and rear trailing arm bushings (RTABs) with OEM Z4M parts and Vorshlag limiters with the RTABs, installed Conforti Shark Injector, flushed the power steering fluid, parking brake adjusted, and installed UUC Evo3 Short Shift Kit. 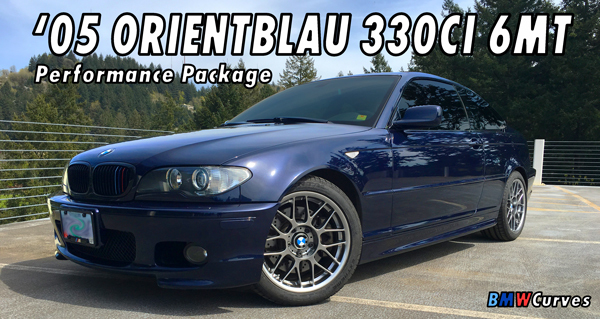 12/04/15 (52,163 miles) - Replaced brake pads with Hawk HPS 5.0 pads and rotors with BMW Performance cross-drilled rotors. 12/05/15 (52,163 miles) - Applied Bimmian ///M colored stickers to front grille. Sprayed lower mesh grille semi-gloss black. 12/09/15 (52,172 miles) - Coded off the auto-lock feature and the exterior temperature below 37F alarm. Enabled the relock car if car unlocked but the door is unopened after 2 minutes feature. 02/29/16 (53,590 miles) - Mounted and balanced APEX ARC-8 17x8.5" ET40 Hyper Black wheels. Shod in Continental Extreme Contact DW 245/40R17 tires. 03/26/16 (53,883 miles) - Installed styrofoam cones to reduce rear deck lid rattle. 07/09/16 (54,979 miles) - Brake fluid flush (including clutch line), replaced passenger seat lumbar air pump, repaired passenger seat heating element ground wire, installed passenger headlight cover. 07/10/16 (54,992 miles) - Installed the passenger side M3 door card, added Noico-branded sound deadening material, installed door clips with foam washers to minimize door rattle, and swapped over my speakers. 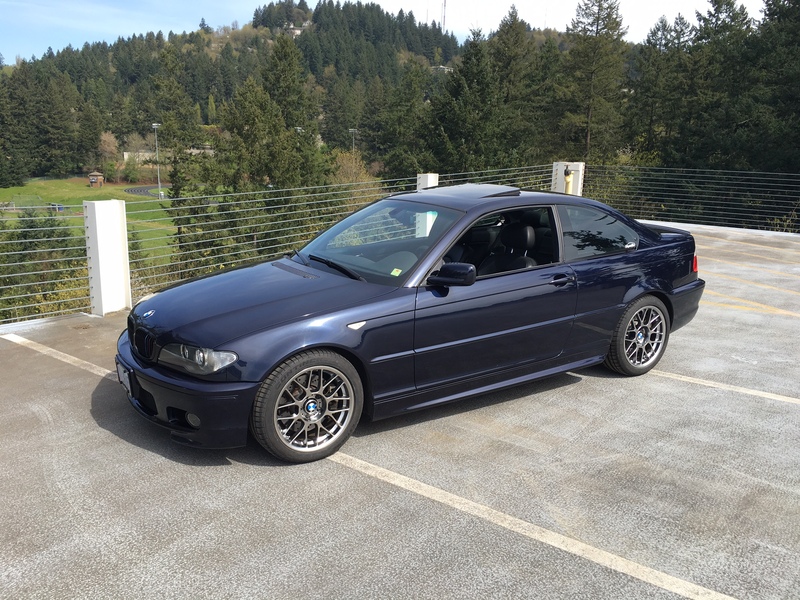 07/11/16 (55,010 miles) - Installed the driver side M3 door card, added Noico-branded sound deadening material, installed door clips with foam washers to minimize door rattle, and swapped over my speakers. 07/13/16 (55,044 miles) - Installed rear interior including headrests, rear "door" cards, rear side bolsters, rear seat backs, and rear seat bottom. Swapped over the speakers from my rear "door" cards to the M3 "door" cards. Last edited by BMWCurves; 01-11-2018 at 06:08 PM. In my previous car, the '03 330Ci, I installed the aux input (part no: 82110149389) in the extra container in the center console. I liked it since you could hide it away, but after several road trips with people in the back, I found it annoying that they couldn't play their music since the aux cable wasn't long enough to reach them. This time around I opted to install it by the rear cup holder. I think it is pretty inconspicuous since the arm rest hides it, it can now reach the rear passengers, and it's cheap to replace the cup holders if I want to relocate the aux port. I did scratch up the cup holder's material a little bit tightening town the nut, but decent otherwise. Last edited by BMWCurves; 04-20-2015 at 09:31 PM. I came down with a cold this weekend but got everything done except for bleeding the new coolant, replacing differential fluid (I broke my makeshift 14mm hex bolt/wrench, so I have to go buy one), and replacing the power steering fluid. Anyone have experience with PS fluid? I've never done it on an E46 before and most DIYs either have you 1. use a turkey baster to pull out the old fluid from the reservoir, pour in some new fluid, turn the steering wheel, and rinse and repeat until the fluid is relatively clear or 2. Release one of the hoses to the PS pump and let that drain then fill up the system with new fluid while turning the steering wheel back and forth to work out bubbles. I assume the second method is the preferred method to truly flush the system, but I'm hesitant. I've heard both. Don't have 1st hand experience to tell you which. I'm sure someone will chime in. Who is that radiator made by? Behr. It was actually slightly different than the one it replaced. The drain plug is a different fit than the original one, but everything else is the same. Any fitment issues? Thought on quality? Came with a new drain plug? 1. In the original radiator there is a blue plastic philips screw drain plug that you remove that fits inside a plastic hex-looking housing. In the new radiator, there is no blue plastic philips screw, instead the whole hex-looking housing screws off instead. 2. Where the mounting bracket for the expansion tank attaches to the radiator, there is a small hole near the drain plug that it nestles into just above the plug. In the original radiator this hole was hollow and the radiator drained in a narrow tube within this hole (kind of hard to describe). But in the new one, the hole is "sealed." Doesn't really affect fitment, just something different I noticed. Overall the quality seems the same. Both have the poor design of having plastic inlets. The one annoying thing is that you have transfer over the bottom plastic bracket from the old radiator to the new one (a new bracket wasn't included with the new radiator). To get it out without destroying the plastic bracket I had to bend and disfigure the old radiator a bit.